Our partnership enables HRP to create memorable events and provide an improved visitor experience for its customers. Panasonic has a long-term corporate partnership with Historic Royal Palaces (HRP), the independent charity which manages six former Royal residences in the UK. The partnership presents Panasonic with the opportunity to showcase its latest, innovative business technologies, while enabling HRP to provide an improved visitor experience for its customers. HRP puts Panasonic business technology through its paces and in return Panasonic uses some of the UK’s most famous venues for a variety of events. Historic Royal Palaces look after the Tower of London, Hampton Court Palace, the Banqueting House, Kensington Palace, Kew Palace and Hillsborough Castle. Each of the palaces have witnessed peace and prosperity and splendid periods of build and expansion, but they also share stories of more turbulent times, of war and domestic strife, politics and revolution. Panasonic technology enhances visitors experience by using projection and display products to showcase exhibitions which create atmospheres and capture the imagination. The exhibitions tell stories of different people across a range of periods in history. The first joint initiative saw 12 Panasonic high brightness projectors (PT-DZ21K2) used as part of the 500th anniversary celebrations at Hampton Court Palace. 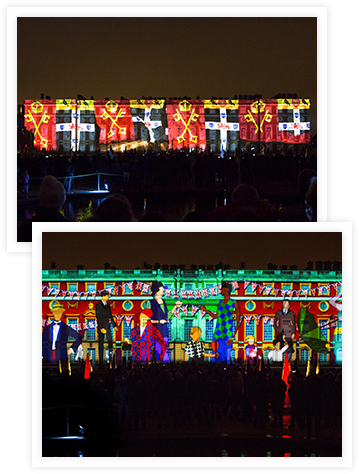 A 22-minute projected artwork, which told the architectural and cultural history of the palace, played for three nights over the Easter weekend 2015. Panasonic laser projectors are now being used in a new exhibition in the Palace, bringing animation to the Hampton Court story. A total of eight projectors have also been installed within the Tower of London jewel house, helping to interpret the story of the Crown Jewels.